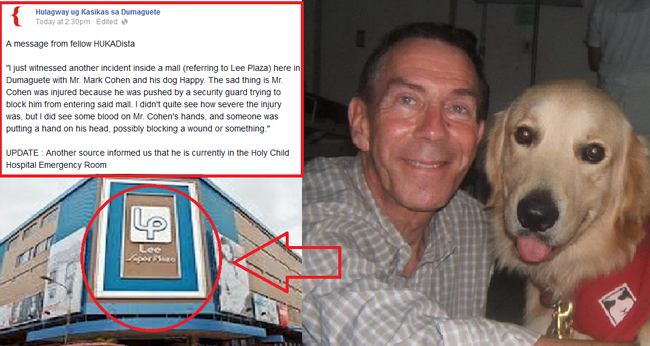 Mark Cohen, a certified Person With Disability, and his guide dog were denied entrance in Lee Super Plaza, September 4, 2014. Mr. Cohen and‘Happy’ first made a buzz in the social media networks last week when their photos and a video were uploaded online. 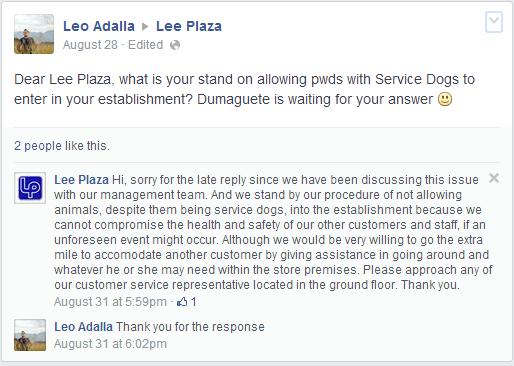 Lee Super Plaza, got a post on their wall from a Facebook user, Leo Adalla, inquiring about the mall’s stand on the issue. According to the management, they would strictly imply their No Pet Policy for the health and safety of their staff. Soon., Mr. Cohen and Happy presented themselves in the mall entrance. 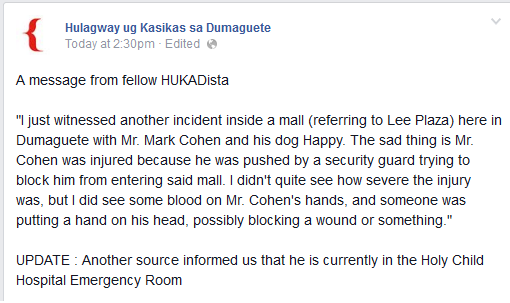 According to a witness, the guard tried to stop them and accidentally pushed Mark Cohen. While it is still unclear whether he sustained some serious injuries, it was said that some blood was seen on the foreigner. He was rushed to the Holy Child Hospital to be attended immediately. Here was the Post from Hukad Facebook Page talking about this issue. Lee Super Plaza still pursuing their policy of No pets Allowed inside the mall as they posted on Facebook account claiming as leesuperplaza. Previously, Last August 17 and 27, Mr. Cohen, Director of the International Institute of Assistance Dog Training, tried to enter the premises of Robinson’s Dumaguete, where a guard firmly stood by the ‘No Pet Allowed’ policy. Even though he showed the documents proving he is a PWD and he needed the assistance of his golden retriever to mitigate his health condition, the was still unable to get inside and use the mall’s facilities. He then asked to talk to the management, but instead, the police took him in a headquarters for questioning. He was later sent home without any charges. On September 1, the management finally allowed him and his dog to enter the mall and Mr. Cohen wrote on his Facebook his satisfaction on their hospitality. According to Mr. Cohen, he is making a documentary about a country’s awareness on the rights of PWD’s in using public establishments and transportation, especially those who need a trained dog. Some people might think that Mr. Cohen is just using publicity for his profession as a dog trainer. At the beginning of the issue with the Robinsons’ Mall, he was said to be making a public disturbance. We would not know his true intentions on trying the malls’ policies and reactions regarding the matter, but he said that does not aim to gain money. It is good that Filipinos are now curious about the rights and privileges of a certified person with disability. We know that there must be updates on the laws like the definitions of the disabilities. People with disabilities are not only those who are blind, deaf and confined in wheelchairs, there are those who are with epilepsy, parkinsonism and as such. On the other hand, though it may seem to be negative, the malls did not violate any law, it is also true that the managements have the safety of the customers and staff in their minds when they made their decision and stood with their policy.